I have a guilty pleasure: Half-priced chocolate. For pretty much all of my adult life, I’ve delighted in going to the grocery store a day or two after a holiday like Halloween, Valentine’s Day, or Easter and buying a few bags of chocolate at 50% off. Any other time of the year, I’ll just buy one bag when I exhaust my chocolate supply. But not after a holiday. Last year, a company I work with sent me a gift, basically the best gift someone could send me: A box of chocolates. 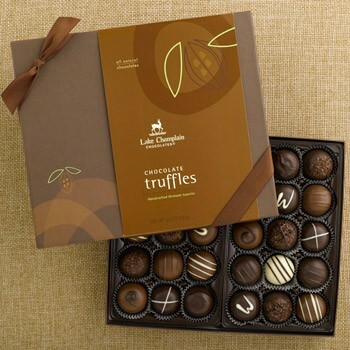 Not just any box of chocolates, but a box of premium truffles from Lake Champlain Chocolates. I savored the truffles while they lasted, but eventually I ran out and had to move on to grocery store chocolate. The memory of those truffles stuck with me, and I knew I had to get more when the opportunity arose. You see, these truffles are very expensive. The best deal on the Lake Champlain website right now is $80 for 30 truffles. It’s a fair price–the truffles are the size of golf balls–but it’s just a little too steep for my tastes. So I subscribed to their e-newsletter and waited patiently. Finally, it happened: A few days after Christmas, Lake Champlain announced that select holiday products would be available at 50% off. I bought 30 truffles that day. A few weeks ago, it happened again: Valentine’s Day was over, and they had extra stock to sell at 50% off. Apparently I bought too soon, because if I had waited another day, they would have offered the same chocolates at 60% off! But that’s okay. I’ve been eating them slowly, one or two a day at most. Maybe three. But here’s the thing: Is this type of buying behavior wrong? If everyone were like me, Lake Champlain would go out of business. So I’m essentially relying on other people to pay full price just so I can continue to pay half price. Is that the right way for me to support a business that I’ve grown quite fond of? At the same time, Lake Champlain doesn’t have to offer 50% discounts on chocolates. That’s their choice. If that stopped offering that option, I wouldn’t consider it an affront, and I’m sure I would occasionally treat myself at full price. What do you think? I don’t presume to know the answer–I’m genuinely curious about whether you think what I’m doing is right or wrong. This entry was posted on Sunday, February 28th, 2016 at 9:48 pm	and is filed under confessions and tagged with confessions. You can follow any responses to this entry through the RSS 2.0 feed. I think it’s okay to buy chocolates on sale. Lake Champlain is probably still making a profit off their truffles at half off, and if they weren’t, they wouldn’t sell them! If no one bought their chocolates at full price, that would just be a signal that their price is too high. What Sheldon said. There is pretty much no business that ever offers a sale that is not still profitable for them. A game store manager once told me that he didn’t like having sales, because when you have regular sales, you train your clientele to wait for the sales. Now, in the hobby game industry, it may be the case that your core audience is your regulars who are often probably your worst customers — hanging around the store but never buying anything until it’s on sale. But with this chocolate company, or any other larger endeavor, the core audience may be larger, and therefore it doesn’t sink you when a handful of people only buy things on sale. In your chocolate example, it has a lot to do with society. Many people buy chocolate on those holidays, and that company makes a lot of money. Since demand is so high then, obviously they produce more chocolate at that time so they don’t run out. Of course, after the holiday, demand is low again, so they liquidate their overstock to get their money back out of it. I suspect you actually understand this very well from your experience as a board game publisher. You can imagine that the winter holiday season is a time of large sales… and you wouldn’t want your game to go out of stock in the middle of that prime season. But if you oversupply, the last thing you want is too much product sitting in the warehouse choking up cash flow, right? I mean, a long as it sells eventually you might not be losing money, but in the meantime, you’re also not able to invest that money into printing the next game. So I’ll turn the question to you… how would you feel about a big fan of Stonemaier games who only buys your games on sale? I don’t think there’s anything wrong with your behavior. That’s how the market works. In fact, if they never had sales, they may never get any of your money (you may simply not buy chocolate), so they’re making more money off of you now than if they never had sales. This assumes that they aren’t selling at a loss when it’s on sale, which is probably true. And if they’re just breaking even, then you’re not hurting them by only buying when there’s a sale. You said “if everyone were like me, they’d go out of business” … consider Kickstarter. There are many backers that won’t back a project unless it’s already passed (or is very likely to pass) its funding goal. If EVERYBODY did that, no project would ever succeed! Sheldon and Joe, thanks for your comments! Seth, I appreciate the analysis here. Kickstarter aside (which I don’t consider a sale price, as the item doesn’t exist yet), it’s for the reasons you mention that I’ve never done a deep-discount sale. I’ve offered bundled pricing and small discounts, but never something as big as this (much less on a regular basis). I think it creates the type of consumer behavior that I’m exhibiting with Lake Champlain, which I consider less than ideal. So to answer your question (“how would you feel about a big fan of Stonemaier games who only buys your games on sale?”), I wouldn’t put my company in that position in the first place. By avoiding the deep-discount ecosystem altogether, I’ve avoided having to feel as I would if a big fan only bought games on sale (I would not feel good about it).